The Foo Fighters played their 20th anniversary show at RFK Stadium in Washington, DC on Saturday following a recent broken leg injury to frontman Dave Grohl. 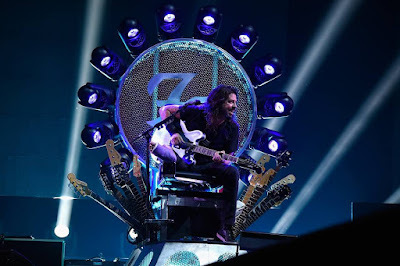 The rocker performed the show sitting on a metal throne, complete with the band’s logo, more than a dozen guitar necks and lights shooting out in every direction. The event in Grohl’s hometown landed 20 years to the day of the release of the group’s self-titled debut album, which the singer wrote and recorded on his own. During the intro to “Big Me” from the debut, Grohl told the story of his June 12 accident in Gothenburg, Sweden, when he fell off stage early in the show, received treatement, and returned to finish the concert. While in hospital following surgery, the singer came up with an idea as to how he could return to the stage for the group’s summer tour of North America. He then dedicated “Big Me” to the group’s road crew for their assistance in making his sketch a reality. The Foo Fighters delivered a 24-song set, opening with “Everlong” and covered material from throughout their career. The event saw the Foos joined by a lineup of guests including Buddy Guy, Gary Clark Jr., Heart, Joan Jett, LL Cool J, Trombone Shorty and Trouble Funk. The Foo Fighters’ next show is scheduled for Mondsay in Camden, NJ.